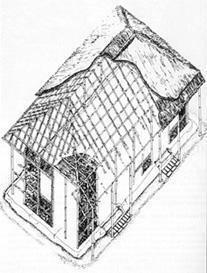 The bamboo houses of the plains are essentially ground level dwellings, unlike those built on hilly terrain which have floor platforms raised on stilts (fig.98). 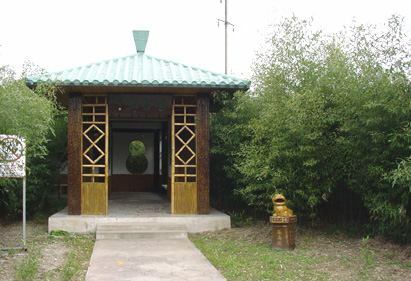 the structure of these houses consists of whole bamboo posts embedded vertically in the ground, and located around a raised rectangular platform of earth filling which is rammed hard and plastered with clay. These post may be single whole culms of a fairly large diameter, large wall thickness, and with short internodes. They are effective load-bearing members which resist deflection or bending on loading. Composite posts are also made by lashing together whole culms of a lesser diameter. Beams of whole bamboo culms are placed to link the posts around the perimeter of the rectangle. The commonly used joint in this case is the saddle joint (fig.99) where the top of the post is cut out to form a saddle on which the beam rests and the joint is secured by binding it with bamboo splits, cane splits or lengths of galvanised iron wire. There are many variations of the saddle joint (figs.100,101). Tie beams are sometimes added between corresponding sets of posts on the longer sides of the rectangular plan (figs.102-104). The roof structure is normally made of prefabricated panels composed of rafters and purlins lashed together and covered with grass thatch (fig. 105). The panels are made on the ground near the house, and then hoisted above the post and beam structure and secured by binding them to the beams and at the ridges so that they support and lean against each other. These roof panels are either rectangular or trapezoidal, and in either case the triangular openings at the ends of the prism formed by the roof structure have to be filled or covered. In the case of the former structure the two end walls are extended above the beam level to meet the roof, and in the latter triangular thatched roof panels are fixed along the slope created by the inclined edges of the trapezoidal panels and lashed in place. The wall structure rests on the posts around the house. Lengths of whole bamboo of a smaller diameter are lashed on to the posts horizontally, at various heights, uniformally spaced from the bottom to the top of the posts. These run all around the house interrupted only to provide the openings necessary for the doorways and windows. These members are whole culms of a smaller diameter and windows. These members are whole culms of a smaller diameter and wall thickness and the internode distance is also much larger than those of the posts. The upper tapering part of bamboo culms which are generally weaker than the basal part are used for these members. Woven bamboo mats (fig.106,107), made either from flattened bamboo boards or from coarse splits, are held against the horizontal whole bamboo members by lengths of longitudinal halves or quarters of bamboo running parallel to each of these members and lashed to the existing horizontals through the mat. These walls are plastered with mud or left exposed without surface treatment.